A Kenyan friend once said to me: “Tanzania may have Kilimanjaro but Kenya has the view”. What they meant by this, was that although Mount Kilimanjaro is in Tanzania, the best place to see it from is Kenya. So when I moved to Kenya 11 months ago, I was determined to find out where this view was and go and see it for myself. After a bit of investigating I found out that the famous view of Africa’s highest mountain can be seen at Amboseli National Park, one of Kenya’s most popular national parks, which is also famous for its huge herds of elephants. Amboseli is situated in the south of Kenya, about four hours from Nairobi, and is made up of plains and swamps. In addition to its views of Mount Kilimanjaro the national park has over a thousand elephants, giraffes, zebras, cheetahs and hundreds of bird species. But when we went on safari with Natural Tours and Safaris a few weeks ago, this was the view of Kilimanjaro that we had. Admittedly if you look carefully at the left hand side of this picture, you can see the bottom of the mountain, but it wasn’t the view I was hoping for. 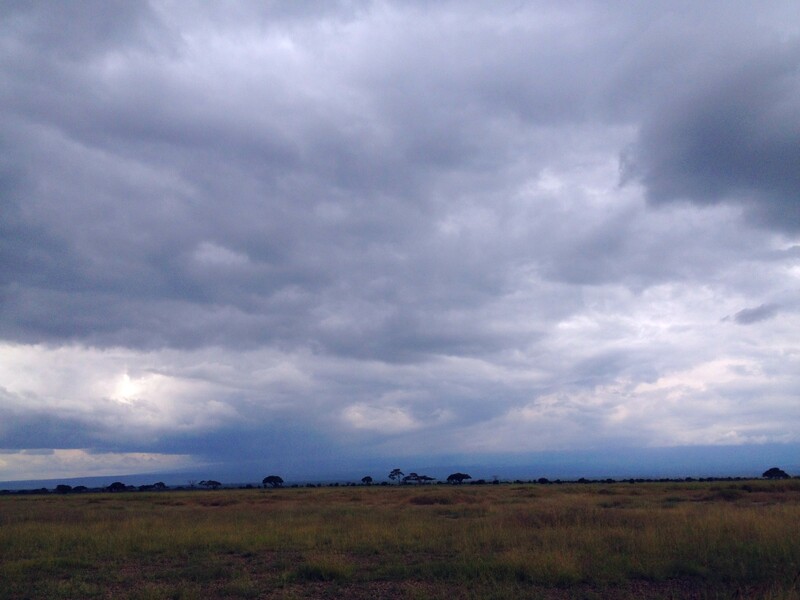 Although the view of Kilimanjaro from Amboseli National Park may be impressive, what I had failed to take into account was the weather – and that apparently the ‘amazing view’ is unpredictable. In fact Mount Kilimanjaro is predominantly shrouded in clouds, and only really seen at dawn and dusk and then only sometimes. But because I am originally from England, and more than accustomed to cloudy days ruining many a day trip, and because I am 44 years old and really should know better, especially as I was with my three children, my teenage strop quickly wore off and I forgot about the view enjoyed the other delights that the National Park had to offer. We saw zebras, giraffes, flamingos, grey crowned cranes with three baby crowned cranes, Thomson’s gazelle, buffaloes, baboons, yellow-billed storks, elephants and also from a distance some hippos, a lion basking in the sun, a malachite kingfisher and the bizarre looking secretary bird, which I have always wanted to see. Despite our positive safari experience, I still hadn’t forgotten about Kilimanjaro and there was still a glimmer of hope of seeing it as I had been told that at dusk and dawn you may be able to see it. There was still no sign of Kilimanjaro and actually rather than the herds of elephants we had been promised to see at Amboseli, we had only had only seen a couple of elephants. Apparently although we were visiting at the end of the rainy season and it had been very cloudy over the last couple of days the elephants had gone to higher ground to avoid the rain and the dangers of potential flooding. I will be honest, I was a little disheartened, OK I was a lot disheartened. However, I was assured by our safari guide that at our hotel, Amboseli Sopa Lodge, if there was to be a view of Kilimanjaro then it was to be had from here, so hopefully tomorrow morning. In the morning, I woke up at 6am, just before dawn to see the mountain. But to my dismay it was even cloudier than it had been the night before. I resigned myself to the fact that on this occasion I would not get the view that I wanted and there was nothing I could do about it. The clouds cleared and suddenly there was Mount Kilimanjaro in all its majestic glory. And over eggs, toast and a pot of tea we all sat gob-smacked by the eponymous view of the mountain that we had all been waiting for. Fifteen minutes later the clouds had returned and like a magic trick the mountain had vanished. Later that morning we had another treat in store. On the game drive we saw a massive herds of the powerful and stately elephants of Amboseli. If that wasn’t amazing enough, there was yet another magical moment for us to enjoy on our Amboseli safari, a baby elephant feeding from his mother. As we drove out of Amboseli National Park there was a huge smile on my face, as I sat back and remembered the magical encounters we had had with Mount Kilimanjaro and elephants of Amboseli. Delightful, Ali. Glad you got to see the mountain after all. It’s a reminder that special things tend to have an element of uniqueness about them, and perhaps capriciousness. That’s why it is special when the mountain unveils its face to you who have been waiting. We are losing mystery and surprise as elements in our lives. I’m glad this experience worked so well for you. Stunning photos. You are certainly getting the most out of your ‘African Experience’. Beautiful Kilimanjaro too…. You lucky things!! We had a couple of amaaaazing days in Amboseli, but we never had a clear view of Kilimanjaro like that! I really, reeeeally loved seeing all the animals though. this looks amazing! what a wonderful experience to share with your kids! Despite the pouty start to the trip (I would’ve been the same way!) it sounds like everything ended well. 🙂 The view is spectacular and I love the wide variety of animals you saw on safari! Keep thinking over where to do a safari and seems like Kenya is the best choice according to your article. All the wildlife my goodness I would be over the moon! It’s on my list and will do it! I’ve always wanted to go on an African safari, and this one looks absolutely amazing! That looks like one adventure trip. Jungle safaris are always special. You get to see so much and so close. Loved experiencing Amboseli National Park through your post… Best.. Backpacking Series. Great post, your pictures are beautiful. I myself look forward to visiting Kenya one day, so that I can see the mighty Kilimanjaro. This is something I’ve always wanted to do. You picked the right word to describe this experience; magical. I would love to have seen all the animals. That stinks that the weather “clouded” your view of Mt. Kilimanjaro! But wow to all the animals you saw in Amboseli National Park! That is awesome. I really have no desire to add climbing Mt. Kilimanjaro to my bucket list but to view it from such a great place in Kenya like Amboseli National Park sounds perfect to me. Love all the pics of the family riding around seeing the Elephants and other African Animals! Awesome! You’re so lucky to be able to see Kili. It is shrouded in clouds on most days. Thanks for sharing this, Ali. Amboseli indeed offers one of the best viewpoints of Kilimanjaro. And your artwork is great, by the way. Oh my goodness the baby elephant is just so adorable! I would love to see all these animals in their natural habitat someday. What a cool experience! I know – just the cutest bundle of fun ever… we were so lucky to see them all so close. Wow, this is incredible. I really love the wild animals in their natural habitat. Your experience has just prompted me to plan a trip here. Oh, this place looks majestic. As if the nature took time and dropped everything beautiful at one place. Kilimanjaro is one of the places I wish to travel in future. Let’s see when it happens. Your wildlife photography is good! 🙂 You are an amazing artist, and now I see your photo work. You have an eye for beautiful things. Aww those elephants are the cutest! Bet this was the ultimate experience! This post made me so jealous! I cannot wait to go to Africa and see all its beauty. A fantastic story and your photos of the wildlife and scenery are beautiful! Thank you for sharing this great experience. Oh Tanzania, the country where I want to go. The closest where I was – Kenya, climbed Mt. Kenya. I want to do Kilimanjaro, but I don’t really like money making machine they started in the village. For 2 people climb you might need 10 local people – porters, cooks, guides and others… Hope it will change someday. Also safari you had looks amazing! 🙂 Did you see the big 5? That one is looking more of a adventure trip than a Jungle safari. Your photos are making it more special. Loved experiencing Amboseli National Park through your post.